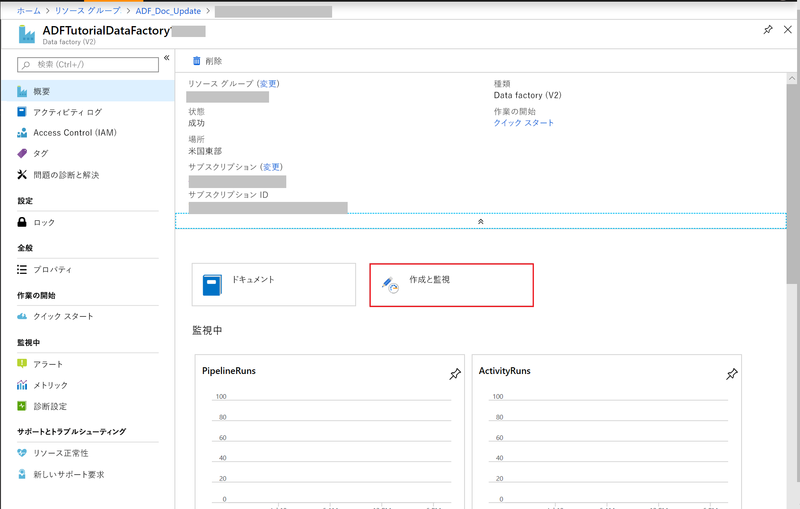 このクイックスタートでは、Azure Data Factory UI を使用してデータ ファクトリを作成および監視する方法について説明します。This quickstart describes how to use the Azure Data Factory UI to create and monitor a data factory. このデータ ファクトリに作成したパイプラインは、データを Azure Blob Storage 内のあるフォルダーから別のフォルダーに "コピー" します。The pipeline that you create in this data factory copies data from one folder to another folder in Azure Blob storage. Azure Data Factory を使用してデータを "変換" する方法のチュートリアルについては、Spark を使用したデータ変換のチュートリアルを参照してください。For a tutorial on how to transform data by using Azure Data Factory, see Tutorial: Transform data by using Spark. Data Factory インスタンスを作成するには、Azure へのサインインに使用するユーザー アカウントが、"共同作成者" ロールまたは "所有者" ロールのメンバーであるか、Azure サブスクリプションの "管理者" である必要があります。To create Data Factory instances, the user account that you use to sign in to Azure must be a member of the contributor or owner role, or an administrator of the Azure subscription. サブスクリプションで自分が持っているアクセス許可を表示するには、Azure portal で右上隅にあるユーザー名を選択し、[アクセス許可] を選択します。To view the permissions that you have in the subscription, in the Azure portal, select your username in the upper-right corner, and then select Permissions. 複数のサブスクリプションにアクセスできる場合は、適切なサブスクリプションを選択します。If you have access to multiple subscriptions, select the appropriate subscription. Azure portal で子リソースを作成および管理するには、リソース グループ レベル以上で Data Factory 共同作成者ロールに属している必要があります。To create and manage child resources in the Azure portal, you must belong to the Data Factory Contributor role at the resource group level or above. PowerShell または SDK を使用して子リソースを作成および管理する場合は、リソース レベル以上での共同作成者ロールで十分です。To create and manage child resources with PowerShell or the SDK, the contributor role at the resource level or above is sufficient. ロールにユーザーを追加する方法に関するサンプル手順については、ロールの追加に関する記事を参照してください。For sample instructions about how to add a user to a role, see the Add roles article. このクイックスタートでは、"ソース" データ ストアと "コピー先" データ ストアの両方に汎用の Azure ストレージ アカウント (具体的には BLOB ストレージ) を使用します。You use a general-purpose Azure storage account (specifically Blob storage) as both source and destination data stores in this quickstart. 汎用の Azure ストレージ アカウントがない場合、作成方法については、「ストレージ アカウントの作成」を参照してください。If you don't have a general-purpose Azure storage account, see Create a storage account to create one. Web ブラウザーで、Azure Portal に移動します。In a web browser, go to the Azure portal. Azure のユーザー名とパスワードを使用してサインインします。Sign in by using your Azure username and password. 左側のメニューの [すべてのサービス] を選択し、"ストレージ" というキーワードでフィルター処理して、[ストレージ アカウント] を選択します。Select All services on the left menu, filter with the Storage keyword, and select Storage accounts. ストレージ アカウントの一覧で、ご利用のストレージ アカウントを (必要に応じて) フィルターで抽出し、該当するストレージ アカウントを選択します。In the list of storage accounts, filter for your storage account (if needed), and then select your storage account. [ストレージ アカウント] ページのメニューで [アクセス キー] を選択します。On the Storage account page, select Access keys on the menu. [ストレージ アカウント名] ボックスと [Key1] ボックスの値をクリップボードにコピーします。Copy the values for the Storage account name and key1 boxes to the clipboard. それらをメモ帳または他のエディターに貼り付けて保存します。Paste them into Notepad or any other editor and save it. このクイックスタートの後の方で使用します。You use them later in this quickstart. 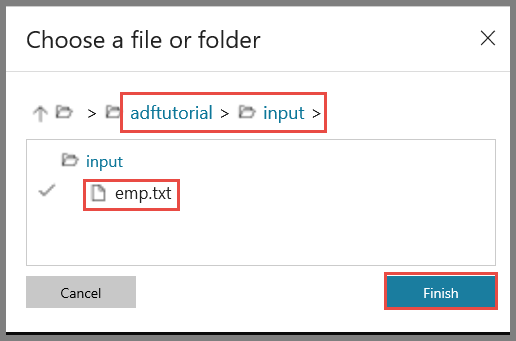 このセクションでは、adftutorial という名前の BLOB コンテナーを Azure Blob Storage に作成します。In this section, you create a blob container named adftutorial in Azure Blob storage. そのコンテナーに input という名前のフォルダーを作成し、input フォルダーにサンプル ファイルをアップロードします。You create a folder named input in the container, and then upload a sample file to the input folder. [ストレージ アカウント] ページで [概要] に切り替え、[BLOB] を選択します。On the Storage account page, switch to Overview, and then select Blobs. [Blob service] ページのツール バーで、[+ コンテナー] を選択します。On the Blob service page, select + Container on the toolbar. [新しいコンテナー] ダイアログ ボックスで、名前に「adftutorial」と入力し、[OK] を選択します。In the New container dialog box, enter adftutorial for the name, and then select OK.
コンテナーの一覧で [adftutorial] を選択します。Select adftutorial in the list of containers. [コンテナー] ページのツール バーで、[アップロード] を選択します。On the Container page, select Upload on the toolbar. [BLOB のアップロード] ページで、[詳細設定] を選択します。On the Upload blob page, select Advanced. メモ帳を起動し、emp.txt という名前のファイルを作成して次の内容を入力します。Start Notepad and create a file named emp.txt with the following content. それを c:\ADFv2QuickStartPSH フォルダーに保存します。Save it in the c:\ADFv2QuickStartPSH folder. まだ存在しない場合、ADFv2QuickStartPSH フォルダーを作成します。Create the ADFv2QuickStartPSH folder if it does not already exist. 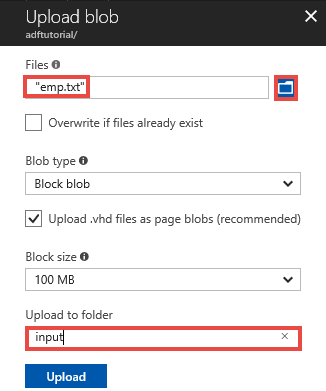 Azure Portal の [BLOB のアップロード] ページの [ファイル] ボックスで、emp.txt ファイルを探して選択します。In the Azure portal, on the Upload blob page, browse to and select the emp.txt file for the Files box. [アップロード先のフォルダー] ボックスの値として、「input」と入力します。Enter input as a value for the Upload to folder box. フォルダーが input で、ファイルが emp.txt であることを確認し、[アップロード] を選択します。Confirm that the folder is input and the file is emp.txt, and select Upload. 一覧に emp.txt ファイルとアップロードの状態が表示されます。You should see the emp.txt file and the status of the upload in the list. 隅の [X] をクリックして、[BLOB のアップロード] ページを閉じます。Close the Upload blob page by clicking X in the corner. [コンテナー] ページを開いたままにしておきます。Keep the Container page open. このクイックスタートの最後で、このページを使用して出力を確認します。You use it to verify the output at the end of this quickstart. Web ブラウザー (Microsoft Edge または Google Chrome) を起動します。Launch Microsoft Edge or Google Chrome web browser. 現在、Data Factory の UI がサポートされる Web ブラウザーは Microsoft Edge と Google Chrome だけです。Currently, Data Factory UI is supported only in Microsoft Edge and Google Chrome web browsers. 左側のメニューの [リソースの作成] を選択し、[分析] を選択して、[Data Factory] を選択します。Select Create a resource on the left menu, select Analytics, and then select Data Factory. 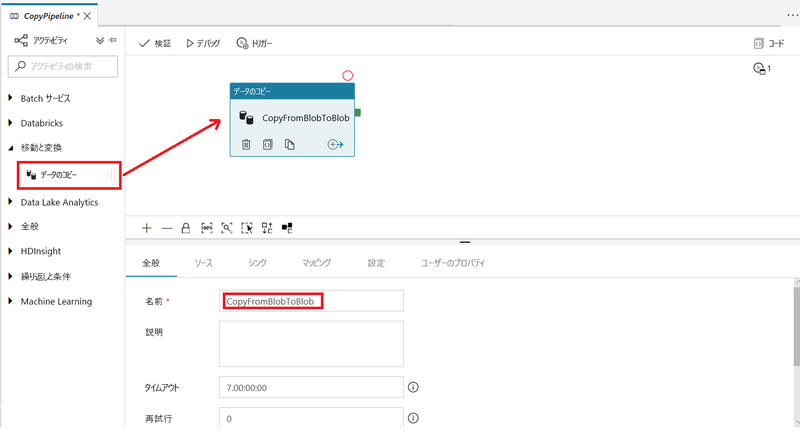 [新しいデータ ファクトリ] ページで、[名前] に「ADFTutorialDataFactory」と入力します。On the New data factory page, enter ADFTutorialDataFactory for Name. Azure データ ファクトリの名前は グローバルに一意にする必要があります。The name of the Azure data factory must be globally unique. 次のエラーが発生した場合は、データ ファクトリの名前を変更して (<yourname>ADFTutorialDataFactory など) 作成し直してください。If you see the following error, change the name of the data factory (for example, <yourname>ADFTutorialDataFactory) and try creating again. Data Factory アーティファクトの名前付け規則については、Data Factory の名前付け規則に関する記事を参照してください。For naming rules for Data Factory artifacts, see the Data Factory - naming rules article. 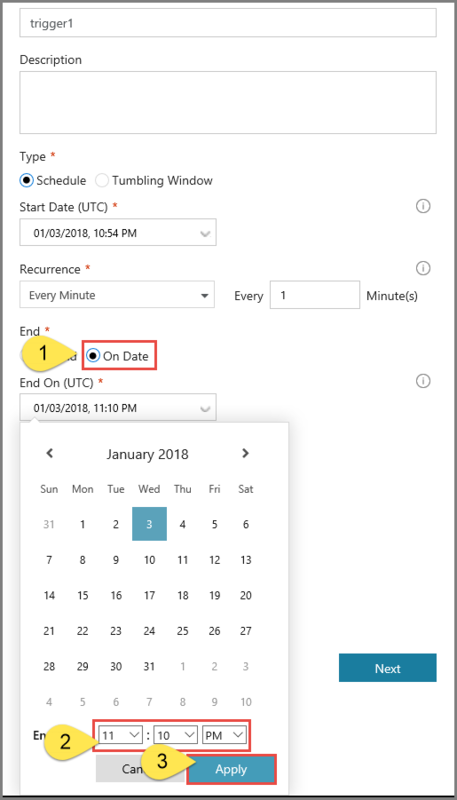 [サブスクリプション] で、データ ファクトリを作成する Azure サブスクリプションを選択します。For Subscription, select your Azure subscription in which you want to create the data factory. [既存のものを使用] を選択し、一覧から既存のリソース グループを選択します。Select Use existing, and select an existing resource group from the list. [新規作成] を選択し、リソース グループの名前を入力します。Select Create new, and enter the name of a resource group. リソース グループの詳細については、 リソース グループを使用した Azure のリソースの管理に関するページを参照してください。To learn about resource groups, see Using resource groups to manage your Azure resources. [バージョン] で、[V2] を選択します。For Version, select V2. [場所] で、データ ファクトリの場所を選択します。For Location, select the location for the data factory. この一覧に表示されるのは、Data Factory でサポートされ、かつ Azure Data Factory のメタ データが格納される場所のみです。The list shows only locations that Data Factory supports, and where your Azure Data Factory meta data will be stored. Data Factory で使用する関連データ ストア (Azure Storage、Azure SQL Database など) やコンピューティング (Azure HDInsight など) は他のリージョンで実行できることに注意してください。Please note that the associated data stores (like Azure Storage and Azure SQL Database) and computes (like Azure HDInsight) that Data Factory uses can run in other regions. 作成が完了すると、[Data Factory] ページが表示されます。After the creation is complete, you see the Data Factory page. [作成と監視] タイルを選択して、別のタブで Azure Data Factory ユーザー インターフェイス (UI) アプリケーションを起動します。Select the Author & Monitor tile to start the Azure Data Factory user interface (UI) application on a separate tab. [始めましょう] ページの左側のパネルで [作成者] タブに切り替えます。On the Let's get started page, switch to the Author tab in the left panel. この手順では、Azure ストレージ アカウントをデータ ファクトリにリンクするためのリンクされたサービスを作成します。In this procedure, you create a linked service to link your Azure storage account to the data factory. リンクされたサービスは、Data Factory サービスが実行時に接続するために使用する接続情報を持っています。The linked service has the connection information that the Data Factory service uses at runtime to connect to it. 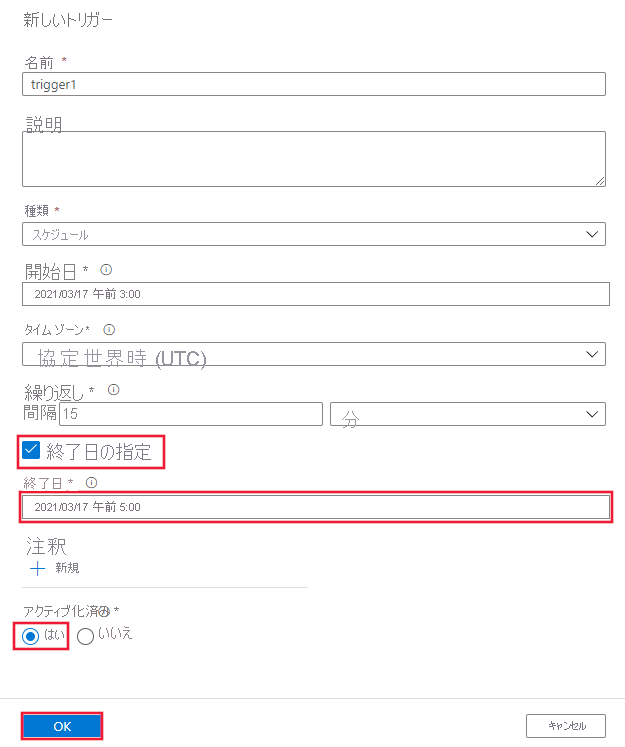 [接続] を選択し、ツール バーの [新規] ボタンを選択します。Select Connections, and then select the New button on the toolbar. 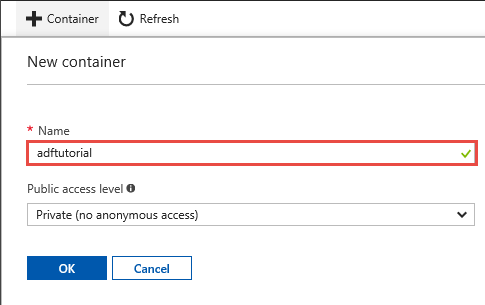 [New Linked Service](新しいリンクされたサービス) ページで [Azure Blob Storage] を選択し、[続行] を選択します。On the New Linked Service page, select Azure Blob Storage, and then select Continue. 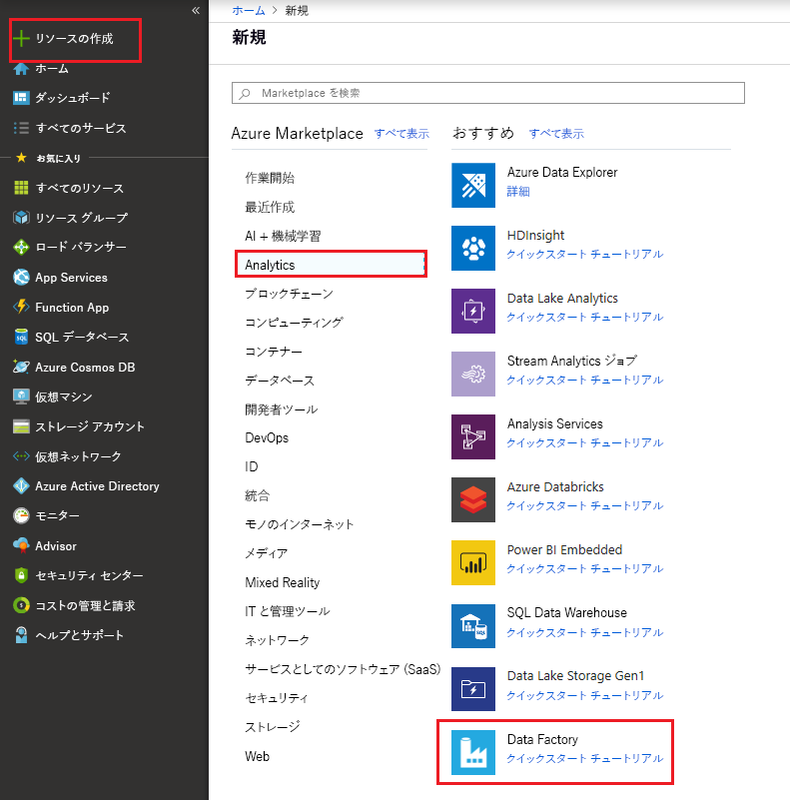 a.a. [名前] に「AzureStorageLinkedService」と入力します。For Name, enter AzureStorageLinkedService. b.b. 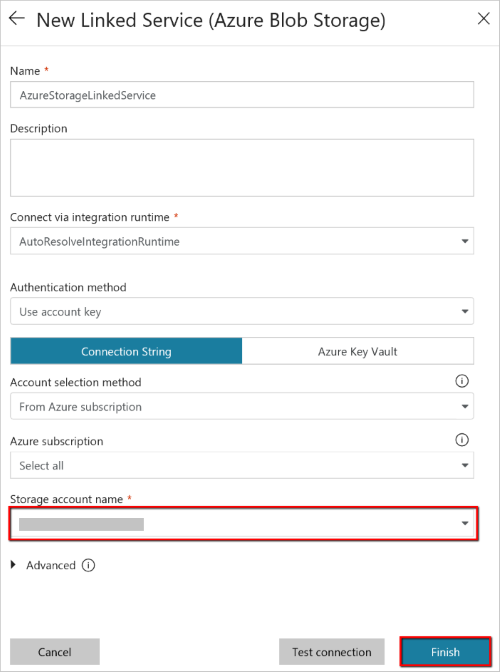 [ストレージ アカウント名] で Azure ストレージ アカウントの名前を選択します。For Storage account name, select the name of your Azure storage account. c.c. [テスト接続] を選択して、Data Factory サービスがストレージ アカウントに接続できることを確認します。Select Test connection to confirm that the Data Factory service can connect to the storage account. d.[Tableau Server return URL]: Tableau Server ユーザーがアクセスする URL。d. [完了] を選択して、リンクされたサービスを保存します。Select Finish to save the linked service. この手順では、InputDataset と OutputDataset という 2 つのデータセットを作成します。In this procedure, you create two datasets: InputDataset and OutputDataset. これらのデータセットの種類は、AzureBlob です。These datasets are of type AzureBlob. 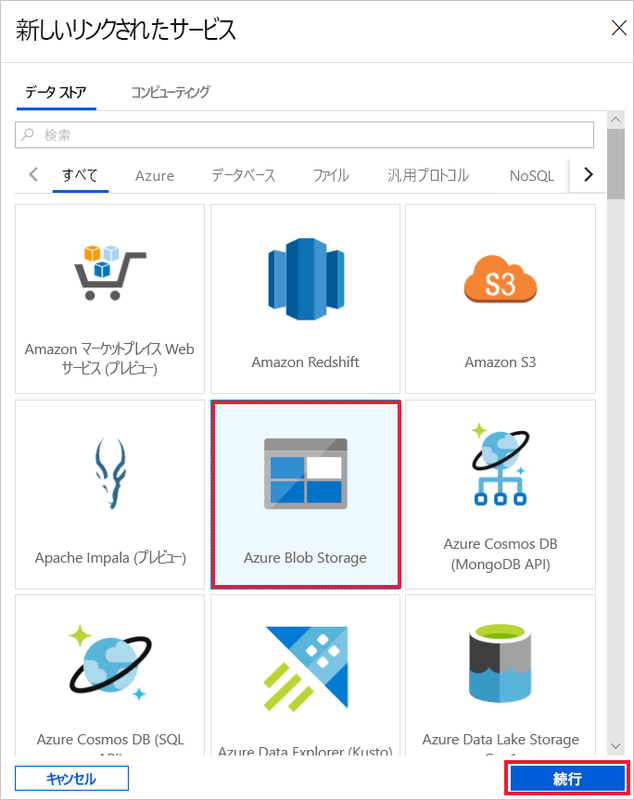 これらは、前のセクションで作成した Azure Storage のリンクされたサービスを参照します。They refer to the Azure Storage linked service that you created in the previous section. 入力データセットは、入力フォルダーのソース データを表します。The input dataset represents the source data in the input folder. 入力データセットの定義では、ソース データを格納している BLOB コンテナー (adftutorial)、フォルダー (input)、およびファイル (emp.txt) を指定します。In the input dataset definition, you specify the blob container (adftutorial), the folder (input), and the file (emp.txt) that contain the source data. 出力データセットは、ターゲットにコピーされるデータを表します。The output dataset represents the data that's copied to the destination. 出力データセットの定義では、データのコピー先の BLOB コンテナー (adftutorial)、フォルダー (output)、およびファイルを指定します。In the output dataset definition, you specify the blob container (adftutorial), the folder (output), and the file to which the data is copied. パイプラインの各実行には、一意の ID が関連付けられます。Each run of a pipeline has a unique ID associated with it. この ID には、システム変数 RunId を使用してアクセスできます。You can access this ID by using the system variable RunId. 出力ファイルの名前は、パイプラインの実行 ID に基づいて動的に評価されます。The name of the output file is dynamically evaluated based on the run ID of the pipeline. リンクされたサービスの設定では、ソース データを含む Azure ストレージ アカウントを指定しました。In the linked service settings, you specified the Azure storage account that contains the source data. ソース データセットの設定では、ソース データがどこにあるかを正確に指定します (BLOB コンテナー、フォルダー、およびファイル)。In the source dataset settings, you specify where exactly the source data resides (blob container, folder, and file). シンク データセットの設定では、データがどこにコピーされるかを指定します (BLOB コンテナー、フォルダー、およびファイル)。In the sink dataset settings, you specify where the data is copied to (blob container, folder, and file). + (正符号) ボタンを選択し、[データセット] を選択します。Select the + (plus) button, and then select Dataset. 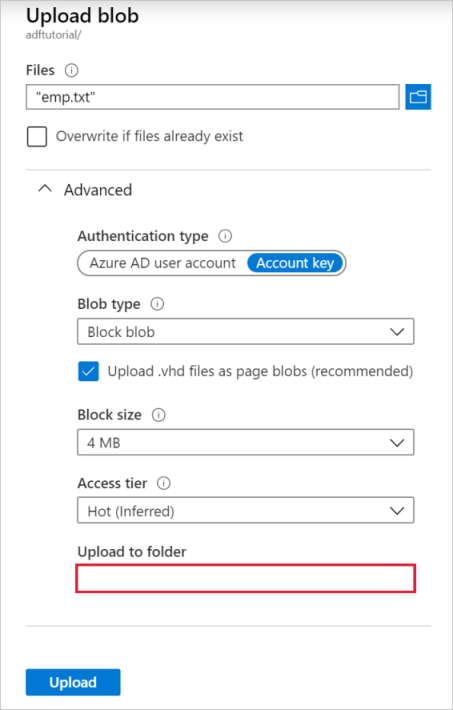 [新しいデータセット] ページで [Azure Blob Storage] を選択し、[完了] を選択します。On the New Dataset page, select Azure Blob Storage, and then select Finish. データセットの [全般] タブで、[名前] に「InputDataset」と入力します。In the General tab for the dataset, enter InputDataset for Name. 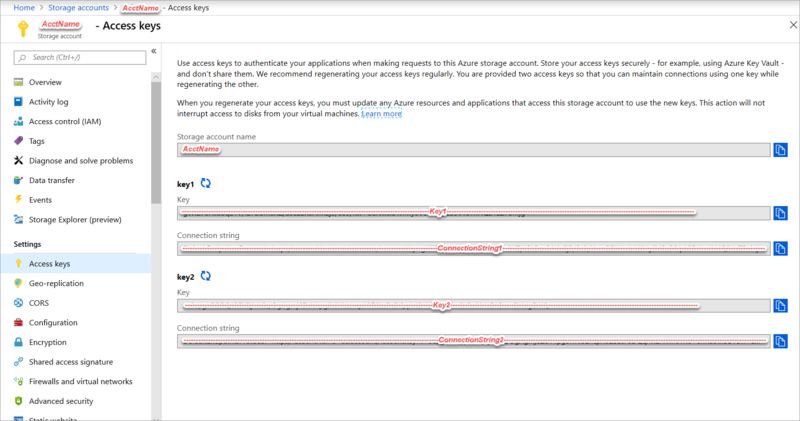 a.a. [リンクされたサービス] で [AzureStorageLinkedService] を選択します。For Linked service, select AzureStorageLinkedService. b.b. [ファイル パス] で、[参照] ボタンを選択します。For File path, select the Browse button. c. c. [Choose a file or folder](ファイルまたはフォルダーの選択) ウィンドウで、adftutorial コンテナーの input フォルダーを参照し、emp.txt ファイルを選択して、[完了] をクリックします。In the Choose a file or folder window, browse to the input folder in the adftutorial container, select the emp.txt file, and then select Finish. d.[Tableau Server return URL]: Tableau Server ユーザーがアクセスする URL。d. (省略可能) [データのプレビュー] を選択して、emp.txt ファイル内のデータをプレビューします。(optional) Select Preview data to preview the data in the emp.txt file. a.a. + (正符号) ボタンを選択し、[データセット] を選択します。Select the + (plus) button, and then select Dataset. b.b. 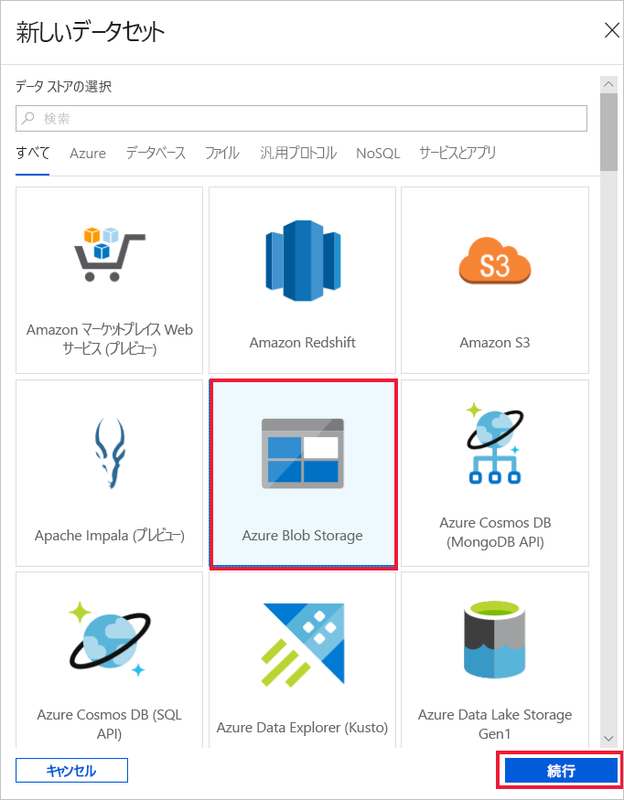 [新しいデータセット] ページで [Azure Blob Storage] を選択し、[完了] を選択します。On the New Dataset page, select Azure Blob Storage, and then select Finish. c.c. [全般] テーブルで、名前として「OutputDataset」と指定します。In General table, specify OutputDataset for the name. d.[Tableau Server return URL]: Tableau Server ユーザーがアクセスする URL。d. [接続] タブで、リンクされたサービスとして [AzureStorageLinkedService] を選択し、ディレクトリ フィールドに、フォルダーとして「adftutorial/output」と入力します。In Connection tab, select AzureStorageLinkedService as linked service, and enter adftutorial/output for the folder, in the directory field. output フォルダーが存在しない場合、コピー アクティビティにより実行時に作成されます。If the output folder does not exist, the copy activity creates it at runtime. この手順では、入力データセットと出力データセットを使用するコピー アクティビティを持つパイプラインを作成および検証します。In this procedure, you create and validate a pipeline with a copy activity that uses the input and output datasets. コピー アクティビティにより、入力データセットの設定で指定されたファイルから、出力データセットの設定で指定されたファイルにデータがコピーされます。The copy activity copies data from the file you specified in the input dataset settings to the file you specified in the output dataset settings. 入力データセットで、ファイル名を指定せず、フォルダーのみを指定すると、コピー アクティビティはソース フォルダーのすべてのファイルをターゲットにコピーします。If the input dataset specifies only a folder (not the file name), the copy activity copies all the files in the source folder to the destination. + (正符号) ボタンを選択し、[パイプライン] を選択します。Select the + (plus) button, and then select Pipeline. 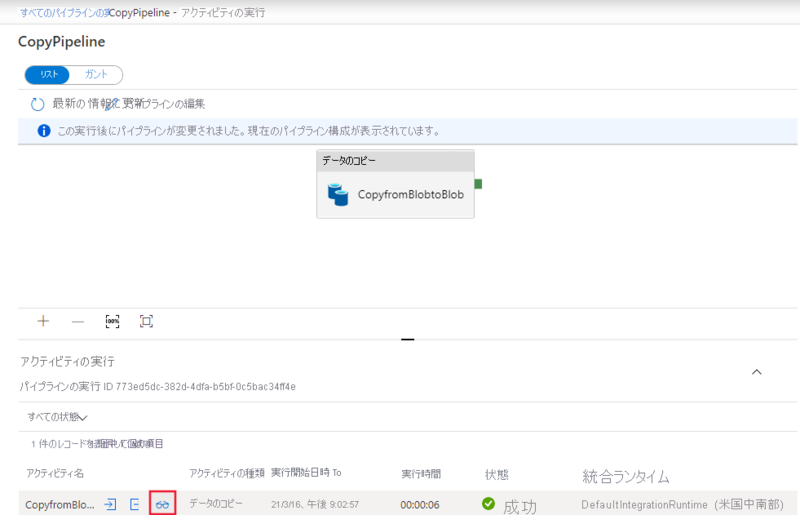 [全般] タブで、[名前] に「CopyPipeline」と指定します。In the General tab, specify CopyPipeline for Name. [アクティビティ] ツールボックスで [Move & Transform](移動と変換) を展開します。In the Activities toolbox, expand Move & Transform. [アクティビティ] ツールボックスからパイプライン デザイナー画面に [コピー] アクティビティをドラッグします。Drag the Copy activity from the Activities toolbox to the pipeline designer surface. [アクティビティ] ツールボックスで、アクティビティを検索することもできます。You can also search for activities in the Activities toolbox. [名前] に「CopyFromBlobToBlob」と指定します。Specify CopyFromBlobToBlob for Name. コピー アクティビティの設定で [ソース] タブに切り替えて、[Source Dataset](ソース データセット) で [InputDataset] を選択します。Switch to the Source tab in the copy activity settings, and select InputDataset for Source Dataset. コピー アクティビティの設定で [シンク] タブに切り替えて、[Sink Dataset](シンク データセット) で [OutputDataset] を選択します。Switch to the Sink tab in the copy activity settings, and select OutputDataset for Sink Dataset. キャンバスの上にあるパイプライン ツール バーの [検証] をクリックして、パイプライン設定を検証します。Click Validate on the pipeline toolbar above the canvas to validate the pipeline settings. パイプラインが正常に検証されたことを確認します。Confirm that the pipeline has been successfully validated. 検証出力を閉じるには、>> (右矢印) ボタンを選択します。To close the validation output, select the >> (right arrow) button. 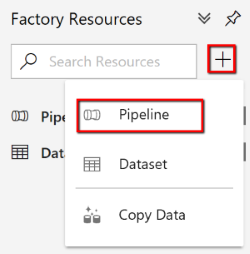 この手順では、パイプラインを Data Factory にデプロイする前にデバッグします。In this step, you debug the pipeline before deploying it to Data Factory. キャンバスの上にあるパイプライン ツール バーの [デバッグ] をクリックして、テスト実行をトリガーします。On the pipeline toolbar above the canvas, click Debug to trigger a test run. 一番下にあるパイプラインの設定の [出力] タブにパイプラインの実行の状態が表示されることを確認します。Confirm that you see the status of the pipeline run on the Output tab of the pipeline settings at the bottom. adftutorial コンテナーの output フォルダーに出力ファイルがあることを確認します。Confirm that you see an output file in the output folder of the adftutorial container. output フォルダーが存在しない場合は、Data Factory サービスによって自動的に作成されます。If the output folder does not exist, the Data Factory service automatically creates it. この手順では、Azure Data Factory にエンティティ (リンクされたサービス、データセット、パイプライン) をデプロイします。In this procedure, you deploy entities (linked services, datasets, pipelines) to Azure Data Factory. 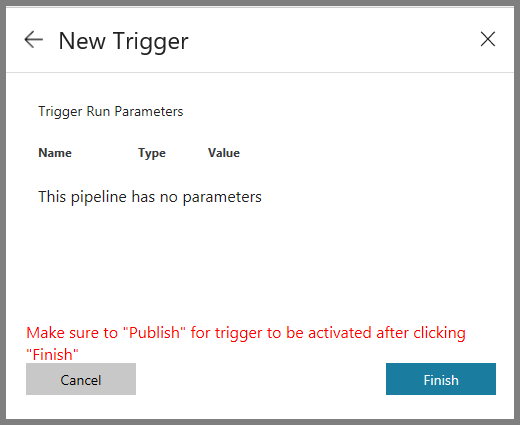 次に、パイプラインの実行を手動でトリガーします。Then, you manually trigger a pipeline run. パイプラインをトリガーする前に、エンティティを Data Factory に発行する必要があります。Before you trigger a pipeline, you must publish entities to Data Factory. 発行するには、上部にある [すべて発行] を選択します。To publish, select Publish All on the top. パイプラインを手動でトリガーするには、パイプライン ツール バーの [トリガー] を選択し、[Trigger Now](今すぐトリガー) を選択します。To trigger the pipeline manually, select Trigger on the pipeline toolbar, and then select Trigger Now. 左側で [監視] タブに切り替えます。Switch to the Monitor tab on the left. [最新の情報に更新] ボタンを使用して、一覧を更新します。Use the Refresh button to refresh the list. [アクション] の [View Activity Runs](アクティビティの実行の表示) リンクを選択します。Select the View Activity Runs link under Actions. コピー アクティビティの実行の状態が、このページに表示されます。You see the status of the copy activity run on this page. コピー操作の詳細を確認するには、[アクション] 列にある [詳細] (眼鏡アイコン) リンクを選択します。To view details about the copy operation, select the Details (eyeglasses image) link in the Actions column. プロパティの詳細については、コピー アクティビティの概要に関するページを参照してください。For details about the properties, see Copy Activity overview. output フォルダーに新しいファイルが表示されていることを確認します。Confirm that you see a new file in the output folder. [パイプライン] リンクを選択すると、[アクティビティの実行] ビューから [Pipeline Runs](パイプラインの実行) ビューに戻ることができます。You can switch back to the Pipeline Runs view from the Activity Runs view by selecting the Pipelines link. この手順は、このチュートリアルでは省略できます。This procedure is optional in this tutorial. "スケジューラ トリガー" を作成して、パイプラインを定期的 (毎時、毎日など) に実行するようにスケジュールすることができます。You can create a scheduler trigger to schedule the pipeline to run periodically (hourly, daily, and so on). この手順では、指定した終了日時まで毎分実行するようにトリガーを作成します。In this procedure, you create a trigger to run every minute until the end date and time that you specify. [作成者] タブに切り替えます。Switch to the Author tab. パイプラインに移動し、パイプライン ツール バーの [トリガー] を選択し、[New/Edit](新規作成/編集) を選択します。Go to your pipeline, select Trigger on the pipeline toolbar, and then select New/Edit. [Add Triggers](トリガーの追加) ページで、[Choose trigger](トリガーの選択) を選択し、[新規] を選択します。On the Add Triggers page, select Choose trigger, and then select New. [新しいトリガー] ページの [終了] で [指定日] を選択し、終了時刻として現在から数分後を指定して、[適用] を選択します。On the New Trigger page, under End, select On Date, specify an end time a few minutes after the current time, and then select Apply. 各パイプラインの実行にはコストがかかります。そのため、開始時刻からほんの数分後の終了時刻を指定してください。A cost is associated with each pipeline run, so specify the end time only minutes apart from the start time. 同じ日であることを確認します。Ensure that it's the same day. ただし、発行時から終了時刻までにパイプラインを実行できる十分な時間があるようにします。However, ensure that there is enough time for the pipeline to run between the publish time and the end time. トリガーは、UI でトリガーを保存したときではなく、Data Factory にソリューションを発行した後で有効になります。The trigger comes into effect only after you publish the solution to Data Factory, not when you save the trigger in the UI. [新しいトリガー] ページで、[アクティブ化済み] チェック ボックスをオンにし、[次へ] を選択します。On the New Trigger page, select the Activated check box, and then select Next. 警告メッセージを確認し、[完了] を選択します。Review the warning message, and select Finish. [すべて発行] をクリックして、変更を Data Factory に発行します。Select Publish All to publish changes to Data Factory. 左側で [監視] タブに切り替えます。Switch to the Monitor tab on the left. [最新の情報に更新] を選択して、一覧を更新します。Select Refresh to refresh the list. 発行時刻から終了時刻まで、毎分 1 回パイプラインが実行されることがわかります。You see that the pipeline runs once every minute from the publish time to the end time. [トリガー元] 列の値に注意してください。Notice the values in the Triggered By column. 手動のトリガー実行は、前に行った手順 ([Trigger Now](今すぐトリガー)) によるものでした。The manual trigger run was from the step (Trigger Now) that you did earlier. [Trigger Runs](トリガーの実行) ビューへの切り替えSwitch to the Trigger Runs view. output フォルダー内に、指定した終了日時までパイプラインが実行されるたびに出力ファイルが作成されていることを確認します。Confirm that an output file is created for every pipeline run until the specified end date and time in the output folder. 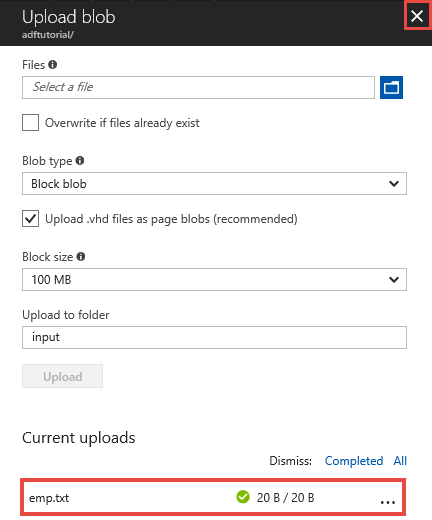 このサンプルのパイプラインは、Azure Blob Storage 内のある場所から別の場所にデータをコピーします。The pipeline in this sample copies data from one location to another location in Azure Blob storage. より多くのシナリオで Data Factory を使用する方法については、チュートリアルを参照してください。To learn about using Data Factory in more scenarios, go through the tutorials.